Slice each piece of focaccia bread in half horizontally; set aside. Remove the sausage from the casings (if using links), crumble and brown in a large, heavy skillet over medium-high heat (about 5 minutes). Remove with a slotted spoon and drain on paper towels. Add the onion to the skillet; sprinkle with salt and pepper, and cook until softened and lightly browned (about 3 minutes). Add the oil and continue to cook over medium-high heat, stirring occasionally until onion is caramelized (about 6 minutes). Remove to a plate. Divide the sausage, onions and cheddar cheese into 4 portions and layer over focaccia bottoms. 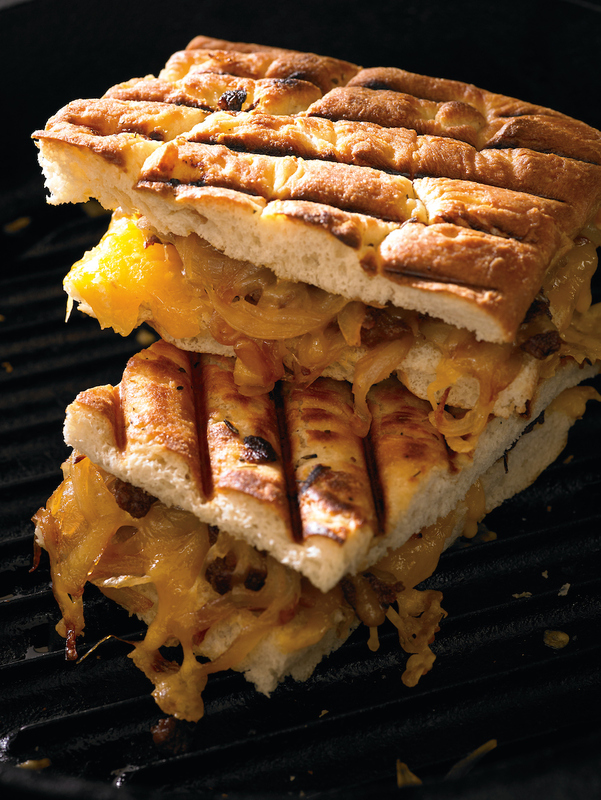 Cover with focaccia tops and cook in a pre-heated panini grill until cheddar cheese is melted (3-5 minutes). Cut each sandwich in half, if desired, and serve immediately.